Saturday, January 21st, will be the first meeting of 2017 for the Hyde Street Pier Model Shipwrights. It’s a new year, and getting together with fellow ship modelers is a great way to start! 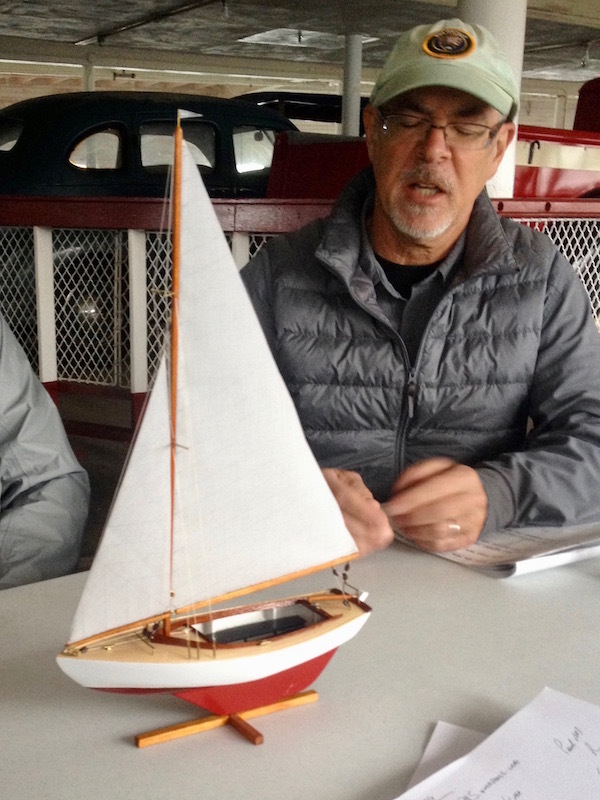 Paul McKenzie and his Sakonnet Daysailer model at the November meeting. The weather is certainly questionable, so I’m hoping many of us will be able to attend with their projects to finish out the year, wish each other happy holidays, and get us ready and inspired to start the new ship modeling year! However, to help entice members to attend and to celebrate the start of the new ship modeling year, the club will be providing free coffee and pastries. So, bring those projects, warm up with coffee and treats, and spend a little time with your ship modeling cohorts! As always, guests are welcome. Meeting takes place in the model shop aboard the ferryboat Eureka at 9:30am. If the Park gate is closed, simply let yourself in. This entry was posted in Club News, Hyde Street Pier, News by catopower. Bookmark the permalink.